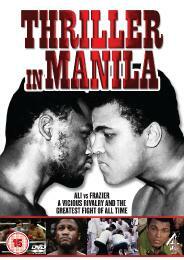 It's kind of odd that a DVD about arguably the greatest heavyweight title fight ever should spell the name wrong - the fight is generally known as the Thrilla in Manila, not Thriller as on the cover. 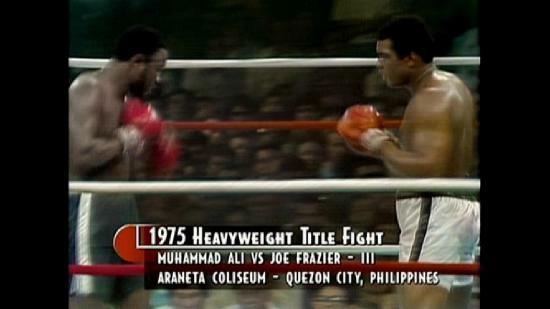 On October 1st 1975 Muhammad Ali and Joe Frazier stepped into a ring in Manila, the Philippines, for a third fight between the two. Four years earlier, in The Fight of the Century, Ali returned from his boxing exile to fight the new champ only to be decked and lose his undefeated record. He easily defeated Frazier over 12 rounds in the rematch and, in the The Rumble in the Jungle, Ali shocked the world (again) when he knocked out the previously undefeated formidable champ George Foreman to regain his heavyweight title. After a string of defences against Chuck Wepner, Ron Lyle and Joe Bugner, Don King organised another extravaganza, teaming up with Fernando Marcos, the new president of the Philippines and a man keen to put his country on the map. The build up was nasty, with Ali taunting Frazier as a 'big dumb gorilla' and an 'Uncle Tom', insults which really hurt the former champion from South Carolina. Given the ease with which Ali defeated 'Smokin' Joe' in the rematch and Foreman's two-round demolition of the then champion, it was expected to be an easy night's work for Ali. No one expected the fight to be as gruelling, compelling and incredible as it was. This documentary looks back at the relationship between Frazier and Ali, how it changed from Ali's exile to their first meeting and the blood feud that started in the build-up to the Thrilla in Manila and continues to this day. A very sharp picture consisting mostly of interviews but with plenty of archive footage interspersed throughout. A clear stereo soundtrack which is pretty undemanding on the speakers, being dialogue dominated, but with good English HoH subtitles available if some of the interviewees are a little hard to understand. There are 25 minutes of scenes that look like they were cut out of the finished film which are interesting and also subtitled. These are available to watch individually or as one block. Of all the sporting rivalries through the years, England and Australia at cricket and the New York Yankees and the Boston Red Sox in baseball are pretty intense but don't rival the passionate hatred that existed between Muhammad Ali and Joe Frazier in 1975. Ali was famed for taunting his opponents, calling Liston a 'big ugly bear' and Foreman 'the mummy' but it was the racial angle of his goading of Frazier that led to 'Smokin' Joe' wanting to punish and even kill the 'Louisville Lip'. 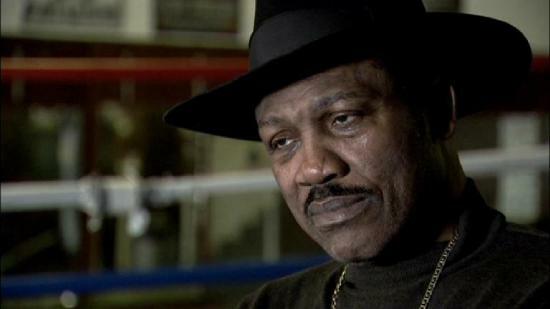 This is a fascinating documentary that lifts the lid on the build-up to the fight and the lingering resentment that Frazier feels towards Ali, even to this day - when Ali lit the Olympic flame in Atlanta, Frazier remarked that he wished Ali would fall in. 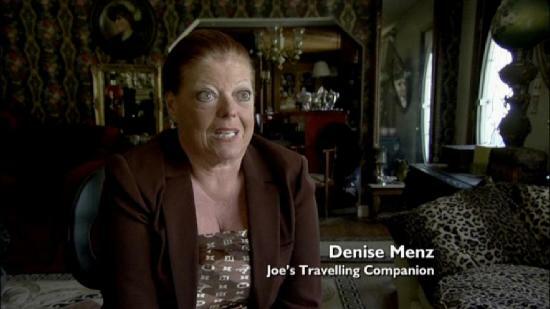 There is an impressive array of interviewees, from Ali's ring physician, Ferdie Pacheco, Ali's biographer Thomas Hauser, Imelda Marcos, various journalists, members of Frazier's family, corner and entourage and 'Smokin' Joe' himself. This concentrates on Frazier and his side of the story - the only representative of Ali is Pacheco, and his viewpoints are put to Frazier's friends and family who dismiss them. 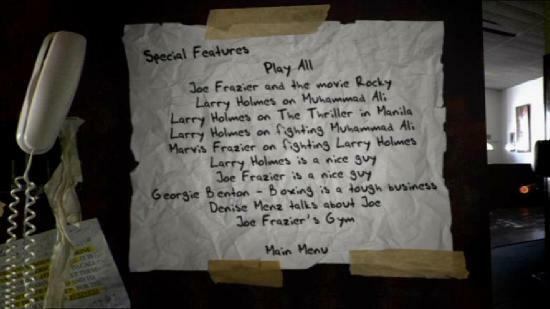 In this sense it is a biased pro-Frazier film but this is probably necessary as he was never as good as self-promoter as Ali, whose story has been told in numerous books and TV programmes. One of the deleted scenes shows the sad state of Frazier's standing in Philadelphia where a statue of the fictional Rocky Balboa exists but there is no such recognition of the great heavyweight champ who put Philly on the map. This is essential viewing for any boxing fan and whether you choose to buy the DVD for repeated viewings and the extra footage or wait to see it on More4 later this year is up to you - all I'll say is don't miss it. Uncanny timing for this review to show up in the retro section, today of all days.